In an atmosphere of protests over the voting procedure abroad, a powerful anti-Ponta movement within the electorate helped Klaus Iohannis win the Romanian presidential election held yesterday (16 November). EURACTIV Romania reports. Although the first round of the election was comfortably secured by the current Prime Minister, Victor Ponta, problems with foreign voting procedures fuelled massive protests against the Social Democrats’ candidate and the highest election turnout since the 90s, with 11 million people casting their ballots. The current Prime Minister has recognized his defeat and has congratulated Iohannis on winning the election. In an interview given after the release of the first exit poll results, Victor Ponta declared that there is no reason yet he should resign, and that until the party asks him to do otherwise he will remain at the head of the government. This has been the third consecutive failure at the presidential elections for the Social Democrats and, most likely, it will register the highest gap between the results of the candidates, at almost 10%. 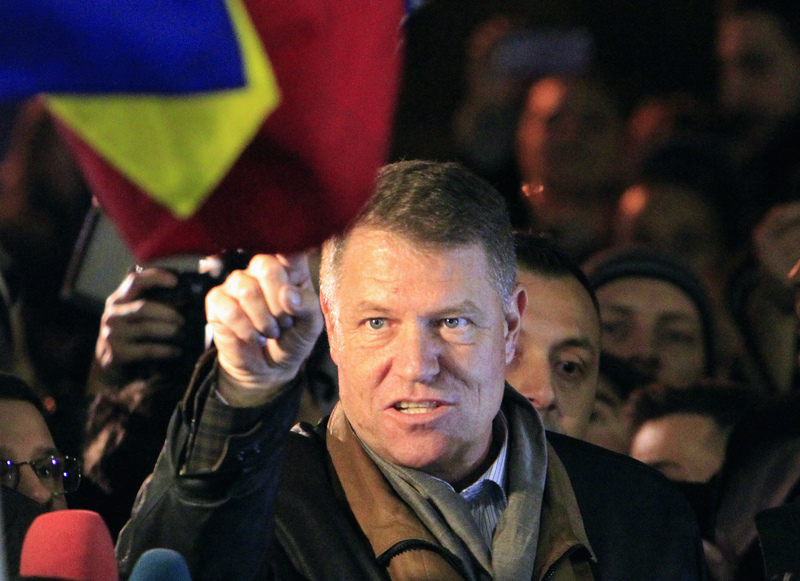 On the other side, the right-wing candidate and future president, Klaus Iohannis, thanked all the Romanians who voted and requested vigilance on the part of his representatives in the vote counting process. Soon after the announcement of the first results, Klaus Iohannis joined thousands of Romanian protesters that marched in the centre of the capital against the current Prime Minister and in solidarity with the Romanian citizens living abroad who did not get a chance to vote. The weekend of the election was filled with manifestations as thousands have taken to the streets to protest against the current Prime Minister and to call for equal voting rights for the Romanians living abroad. The protests that have hit all Romanian major cities, bringing out tens of thousands of demonstrators, continued with the same grievances that have been expressed in the demonstrations that followed the first round of the presidential election. This past week, the Romanian Foreign Affairs Minister resigned, stating that it would be illegal to increase the number of voting stations abroad in the absence of a decision from the Central Electoral Office. The minister’s replacement, former presidential candidate and former director of the Foreign Intelligence Service, Theodor Mele?canu, has maintained his predecessor’s decision and has argued that the actions for supplementing the manpower available at the foreign voting stations would be enough. In addition, the procedures related to the personal statements required abroad from each voter, which were the cause of many delays in the first round, were simplified. Nonetheless, thousands of Romanians remained unable to vote on Sunday, causing massive protests back home that demanded equal voting rights for all citizens, and the resignation of the Prime Minister. Klaus Iohhanis, 55, is the president of the National Liberal Party and the mayor of Sibiu. An ethnic German, Iohannis was formerly the head of the Democratic Forum of Germans living in Romania. In 2009, following a vote of no-confidence against the government of Emil Boc (the Liberal Democrat Party), he was proposed as Prime Minister, but was rejected by then-president Traian B?sescu. In 2013, he joined the National Liberal Party and was at the heart of the conflict that eventually led to the separation of the Social Liberal Union. After a victory against Crin Antonescu in the party’s elections held in 2014, he became its president, and later, following the alliance with the Liberal Democrat party, its official candidate for the Romanian Presidency. Iohhanis has been criticized in the media by his political opponents for being unable to explain how he was able to purchase six houses. “I would like to congratulate Klaus Iohannis on his well-deserved victory in yesterday’s presidential election in Romania. This is excellent news for Romania and for the whole of the European Union. It is a victory for centre-right values and I am proud that the EPP played its role in this. Klaus Iohannis will keep Romania on the democratic path and lead it in the interest of the Romanian people. "I am proud of the Romanian people who participated in high numbers in this important election. However, I am extremely disappointed by the poor voting conditions abroad. The government led by socialist Prime Minister Ponta has to assume responsibility for this, and even more so after having ignored the calls of the international community to assure proper voting conditions. Regardless of these bad voting conditions abroad, the Romanian voters still sanctioned Mr Ponta." Dnevnik, EURACTIV partner in Bulgaria: ??????? ? ??? - ???????????? ? ??????? ???????? ???? ?? ????????? EURACTIV Greece: O «??????? ?» ???????? ???????? ??? ?????????? ??????? ??? ??????? ?